We now have our update on Famitsu.com (also covered on 4Gamer) showing the pictures used in last week's magazine. I recommend taking a look and comparing to the content from the magazine summarised previously as some parts will make a lot more sense alongside proper pictures. Once again there's no real new information in the content of the article, it's simply reproducing details that we already got to see in the physical magazine (though reading it drew my attention to the fact that I made a typo in Sakon's title before, oops). The official Sengoku Basara 4 website has updated as well, opening up the character pages and showing off better pictures of each warrior and their moves. Most of the information was covered in Famitsu last week but there are a few tiny additional points about the younger newcomers. It seems that Katsuie is quite easy to use, with a balanced moveset. His main feature is his ability to gradually increase his attack power and speed using his 'rotation' (as previously described in the Famitsu post). It will also increase his movement speed, and depending on the level of the boost it will affect both his normal attacks and special moves. Meanwhile, Sakon's sword-based attacks will be multi-staged and more powerful than his kicks. His gameplay is said to be focused around switching between his two stances with a button press to continually change his attacks. There are voice samples for Yoshiteru, Masamune and Mitsunari; fans of Sakon and Katsuie will have to wait until the 19th July update to be able to hear them speak for the very first time. A news bulletin has been released to advise that the summer issue of Basara Magazine has been delayed by a month. Its new release date is 27th August 2013 and the contents are as previously advertised. I'm a little relieved, as the previous release date was swiftly approaching with no word at all from the publisher. The link also has a preview image of the Yukimura strap which will be included as a bonus item. 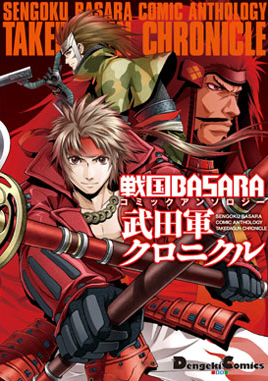 Are they really going to use Yukimura's old Sengoku Basara 3 illustration for the cover instead of a new one? The Zext Works website is showing previews of some new Mame Sengoku Basara items which will be released in September 2013. Priced at ¥1,260 each, there'll be four sets of 'memo stand charms' for the four main pairs of characters who appear in the manga, designed to be carried around or displayed on a desk. Poor Sasuke has been dropped from the selection of characters and they spelt Masamune's name wrong on the shop's website at first (update: it was corrected within a couple of hours). A listing has appeared for the sixth volume of Capbon, Capcom's jam-packed magazine which collects manga and articles about all of their most popular series. This issue will be themed around both Monster Hunter 4 and Capcom's 30th anniversary celebration. Capbon volume 6 will go on sale on 24th September 2013 for ¥1,800. E-Capcom has finally posted the cover art and release information for the Sengoku Basara Comic Anthology 'Takedagun Chronicle' manga. Similar to the 'Dategun Chronicle' which came out a few months ago, this one will be based around Yukimura, Sasuke and Shingen - if it's anything like its predecessor we can expect a multitude of short stories with a light-hearted theme. It's due for release on 31st July 2013 and priced at ¥893.